Groundwater is a source of water for mines, towns, irrigation, stock, industry and recreation. Rockwater provides specialist services in groundwater exploration, resource assessment, borefield modelling, design and installation. 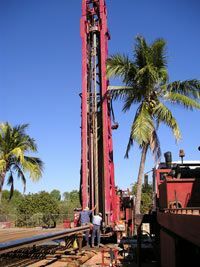 Groundwater supplies have been located, proven, and established by Rockwater's hydrogeologists in environments ranging from the arid interiors of Australia and Africa, to tropical northern Australia and Asia. Up-to-date exploration, testing and evaluation techniques are utilised. Groundwater resources are assessed quantitatively using volume/through-flow calculations and numerical modelling. The Perth Basin, extending from Geraldton to the south coast of WA has been the only source, or a major contributor, of the water supplies for all the towns, cities and mines in this Region. Rockwater has played a major part into tapping these aquifers for Perth, Busselton, Bunbury and other coastal towns. Below are some projects utilising the Groundwater Supplies service provided by Rockwater. Please click a link for more details. Below are some tools Rockwater uses to develop groundwater sources. Please click a link for more details.